Brahma is the title given to the engineer and manager of the universe. He is the first created entity within the universe. The Supreme Person Krishna, in His role as Vishnu, creates the material world. He then empowers a Brahma to act as the engineer and manager within each universe. Of all the demigods in charge of generating various species of life and managing universal affairs, Brahma is the chief. Brahma is also the original spiritual mentor of everyone within the universe. Krishna entrusts him with the sum total of all knowledge—the Vedas—by which everyone can attain success in life and ultimately return to the spiritual world. Brahma, in turn, sees to it that Vedic knowledge is spread everywhere by his representatives. This mission is known as the Brahma-sampradaya, or school of theistic thought originating from Brahma. Brahma's birth is an extraordinary event occurring at the beginning of creation. Vishnu lies down within the universe and manifests a lotus flower from His navel, the stem of which contains all the planetary systems. 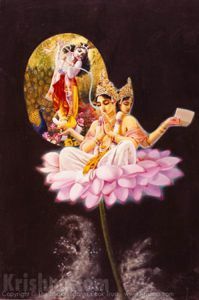 Brahma appears on top of this lotus flower and performs prolonged meditation before beginning his work. The Bhagavad-gita says that Brahma lives for hundreds of trillions of years. Whenever a crisis arises within the universe that the administrative demigods can't solve, Brahma approaches Vishnu for assistance. The Srimad-Bhagavatam reveals Brahma's close relationship with the Supreme Person, and includes some of Brahma's prayers, which are extraordinary insights into transcendental reality. The painting shows Krishna, the Supreme Person, communicating Vedic knowledge to Brahma via transcendental flute sound. - revealing the thought process behind the creation of the universe. - clearing up some misconceptions about the "Hindu Trinity." - a look at the Brahma-samhita, Lord Brahma's firsthand account of the spiritual world as Krishna revealed it to him. - visiting a temple of Brahma that has attracted sages and ascetics for thousands of years. - spoken after his bewilderment by Krishna's supreme mystic power. - although we may be astounded by Brahma's life span, to him it seems quite normal and, if anything, rather short. "In the Vedic literatures Brahma is described as the supreme god or the head of all other gods like Indra, Chandra and Varuna, but the Srimad-Bhagavatam confirms that even Brahma is not independent as far as his power and knowledge are concerned. He received knowledge in the form of the Vedas from the Supreme Person who resides within the heart of every living being." "When He [Lord Vishnu] saw that within the universe there was only darkness and space, without a resting place, He filled half of the universe with water from His own perspiration and laid Himself down on the same water. This water is called Garbhodaka. Then from His navel the stem of the lotus flower sprouted, and on the flower petals the birth of Brahma, or the master engineer of the universal plan, took place. Brahma became the engineer of the universe, and the Lord Himself took charge of the maintenance of the universe as Vishnu." "Whenever there is trouble in the universe that cannot be solved by the administrative demigods, they approach Brahma for a solution, and if it is not to be solved even by Brahma, then Brahma consults and prays to the Ksirodakashayi Vishnu for an incarnation and solution to the problems." "The Lord instructs Brahma in Vedic knowledge in order to diffuse this knowledge to the conditioned souls. The conditioned souls are forgetful souls in their relationship with the Lord, and thus a period of creation and the process of dissemination of Vedic knowledge are necessary activities of the Lord. Lord Brahma has a great responsibility in delivering the conditioned souls, and therefore he is very dear to the Lord. Brahma also does his duty very perfectly, not only by generating the living entities but also by spreading his party for reclaiming the fallen souls." "By human calculation, a thousand ages taken together form the duration of Brahma's one day. And such also is the duration of his night." I thought Brahma was the creator. Does Brahma create this world, or does Krishna? How do we exist during Brahma's night, when everything material is annihilated? Does time transpire at same rate for Brahma as it does for us? How can he live for trillions of years?